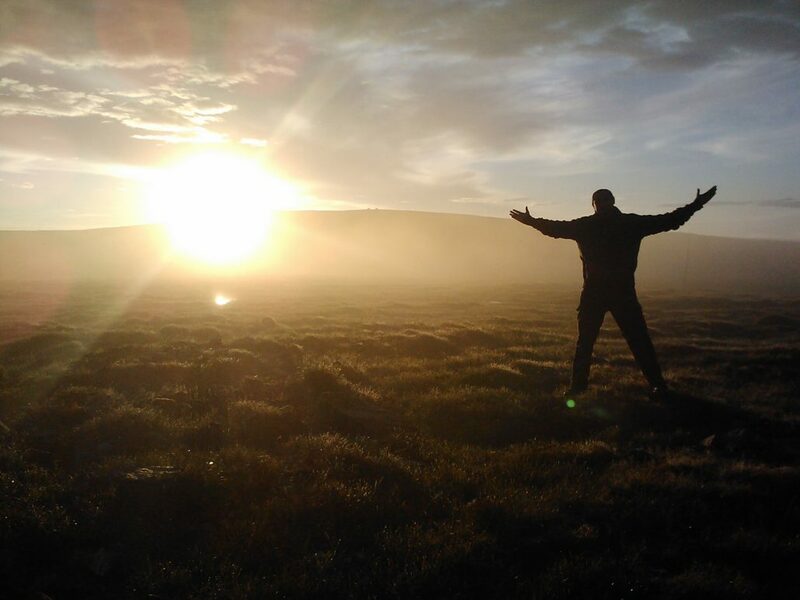 Here’s the story of our journey north, to Lappland inside Norway’s Arctic Circle! 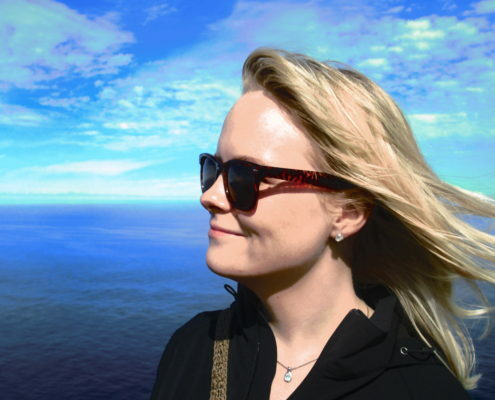 My wife Felizia (who’s Swedish) and I embarked on this trip in the middle of summer, July, actually. 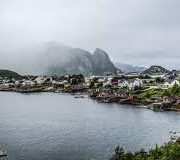 But this was Scandinavia, so warm clothing was still necessary, as daytime temperatures were in the 50’s – 60’s, and nighttime lows could easily get into the 20’s – 30’s. 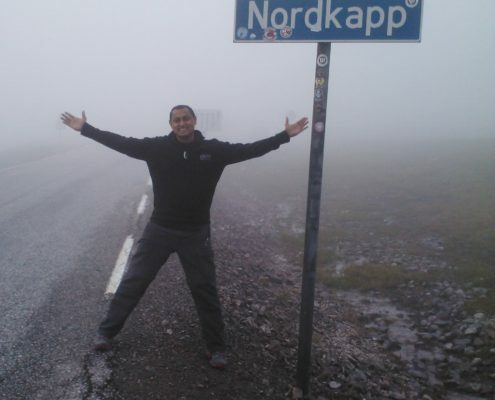 The trip began on highway E14 in Östersund, in the north of Sweden. Things are generally less expensive in Sweden than in Norway, so many travelers make the effort to stock up on supplies before crossing the border from Sweden into Norway…if they’re coming from that direction, of course. We were no exception. All the basics including sausage, pasta and whiskey were included. 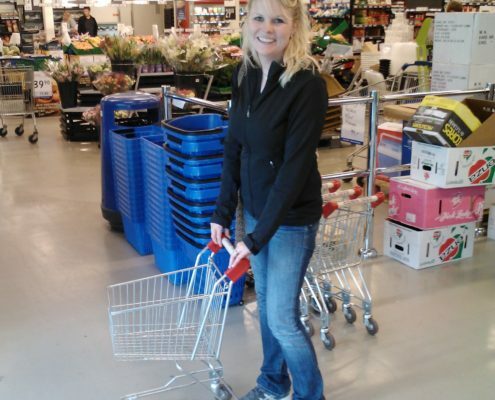 Felizia doing a “little” shopping for the basics. Our faithful Citroën Berlingo “Berran”. There’s a kitchen sink in there somewhere as well. The mostly pine trees of the coniferous Boreal Forest and tranquil lakes of Sweden’s Norrland (by the western border) eventually gave way to the more mountainous terrain of Trondheim, Norway. The driving time/distance on the first day was about 3.5 hours/265 km. 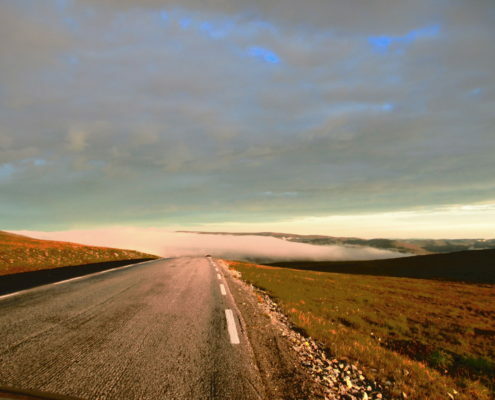 The scenic drive from the west of Sweden to central Norway. 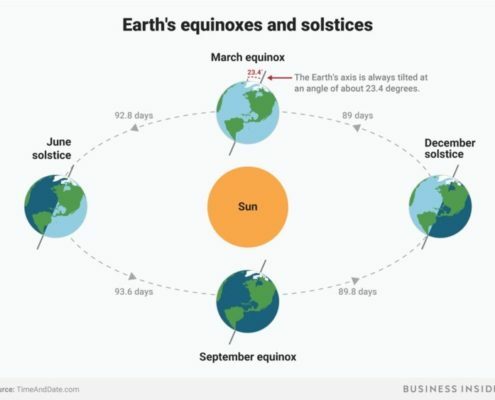 Tilt of the Earth’s axis and its orbit around the Sun produces the four seasons. 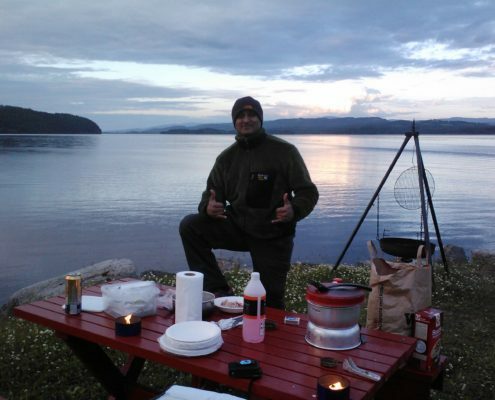 Almost like sleeping at home – the first night of camping in Norway. Cookin’ up some mygg soup and enjoying a Norrlands Guld (5.5%)!!! On the second day in Norway we started north on highway E6 but focused on finding the most scenic route (which meant no highways) for the long drive north. Just about on every turn there’s something amazing to see, and warranted a stop. Fishing boats, waterfalls and strange geologic rock formations were just a few of the spectacular sites along the way. Sprinkled along the way were also a mix of authentic traditional structures and mostly small modest houses. 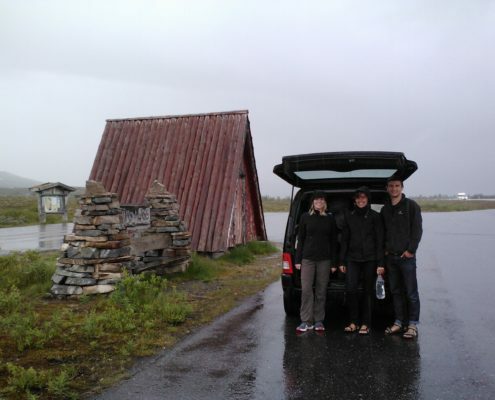 Here and there we found lappkåta (teepee huts) of the indigenous Sami (or lapp as they are commonly referred to). 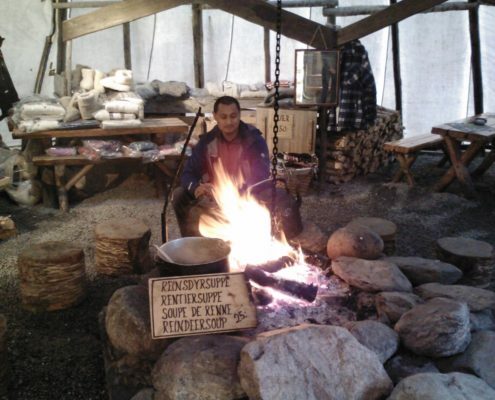 The Sami are welcoming people, and happy to invite you in for some reindeer soup while trying to sell you something crafty. My guess is that tourism has become more profitable than reindeer herding in later years. Inside a “typical” lappkåta (Sami teepee hut). 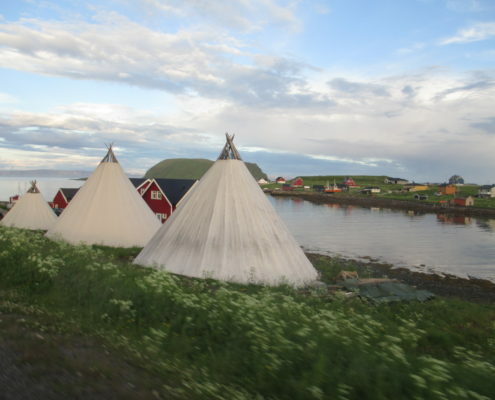 The indigenous Sami people live in huts such as these. A million pristine lakes. 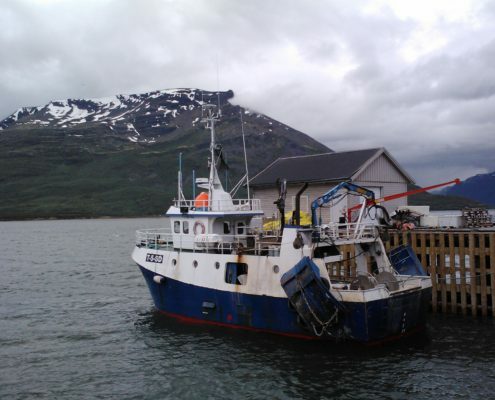 The fishing industry flourishes. 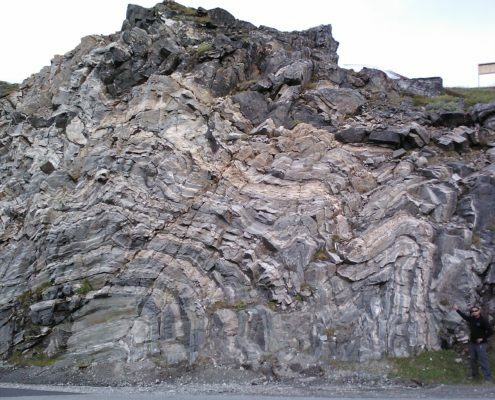 Geology at work – Unconformities and Discontinuities. The things you find when you’re not looking for them – graffiti welcomed. As the journey north continued, the landscape changed noticeably, with fewer large trees, more wide open spaces and mountainous terrain. It made finding a comfortable camping spot to pitch a tent a bit of a challenge at times. 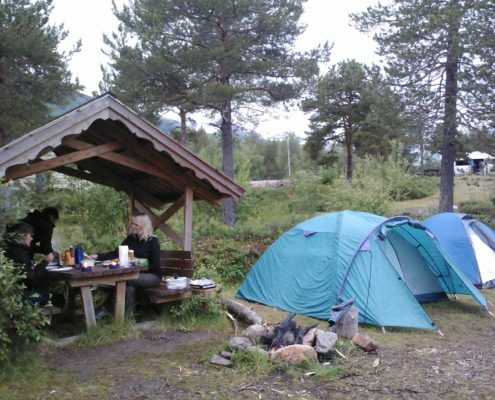 In the Scandinavian countries, it’s legal to camp for only one night at a time on someone’s land, a concept known as allemansrätt (freedom to roam or “wild camp”). The restriction to this is that you must camp at a certain minimum distance from any dwelling structures. The actual minimum distance varies by country, but typically is in the range of 150 meters. When the going gets tough, with terrain, weather, etc., there is another option for shelter. 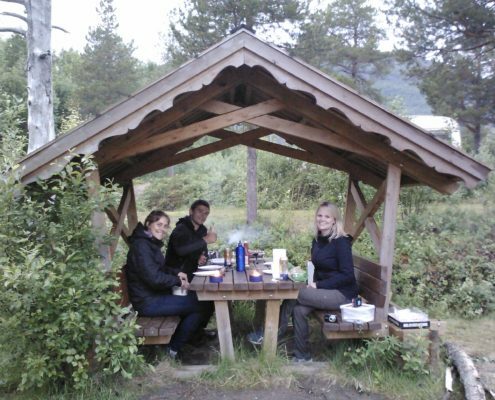 Many land owners, and the government as well, provide tiny houses – called hytte, often furnished with just beds, a table and cooking corner. Guests bring their own sheets, towels, kitchenware and other necessities. They offer communal bathroom and hot shower areas. 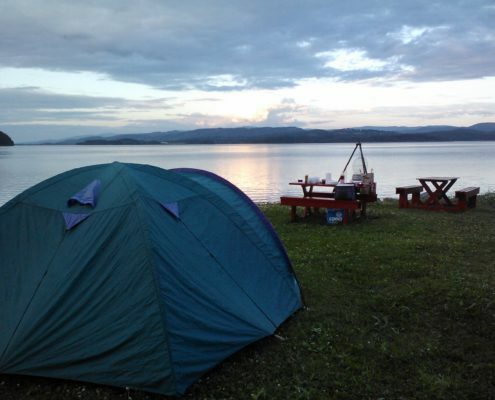 A hytte typically costs around US$80/night (and be prepared to pay 10kr for a 2 minute shower). 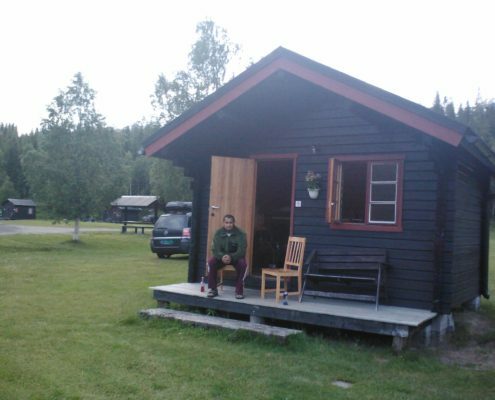 The picture below is one of the hytte we stayed at. It’s very modest, but welcoming accommodations for a night or two. Small, but comfortable hytte accommodations. On the third day heading north, we encountered two hitchhikers who made it all the way from Poland! 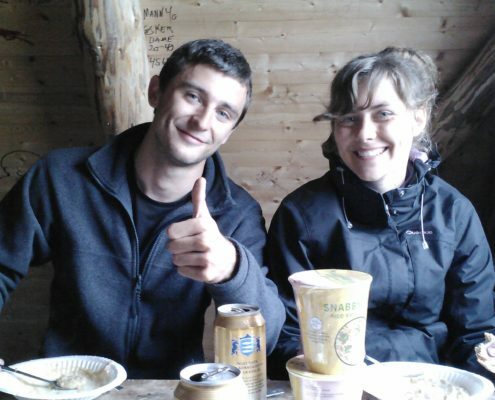 Konrad and Dominika would turn out to become our close friends with whom we shared the next few days. They were trying to make their way north as well. We pitched our tents together, cooked dinner and shared lots of stories and what I believe was a polish version of hembränt (moonshine). Dominika actually turned 21 during our trip so we enjoyed a little birthday celebration with her. Sure beats any night club! 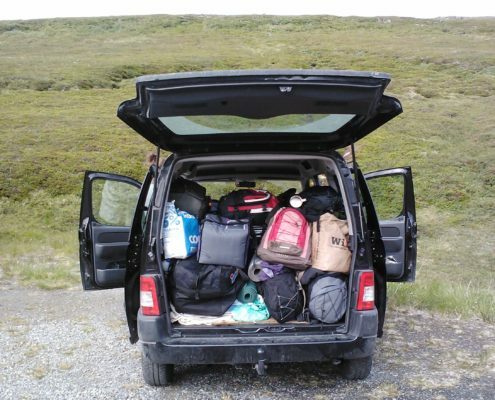 Konrad and Dominika – The best hitchhikers ever! We made our own little campground each evening. The home-made Polish beverage was just what the doctor ordered. 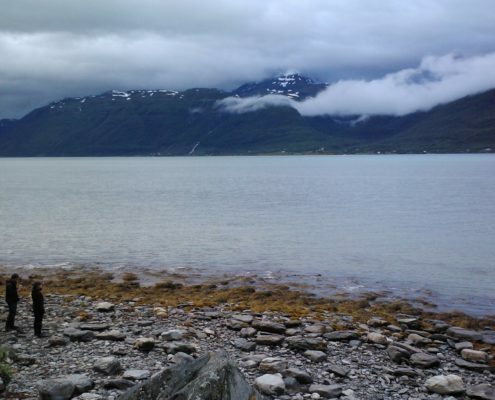 After the birthday celebrations in the chilly, wet weather of Norway’s north, we packed up and continued the trek. Somewhere around this point we made a decision to push as far north as the road infrastructure would allow. 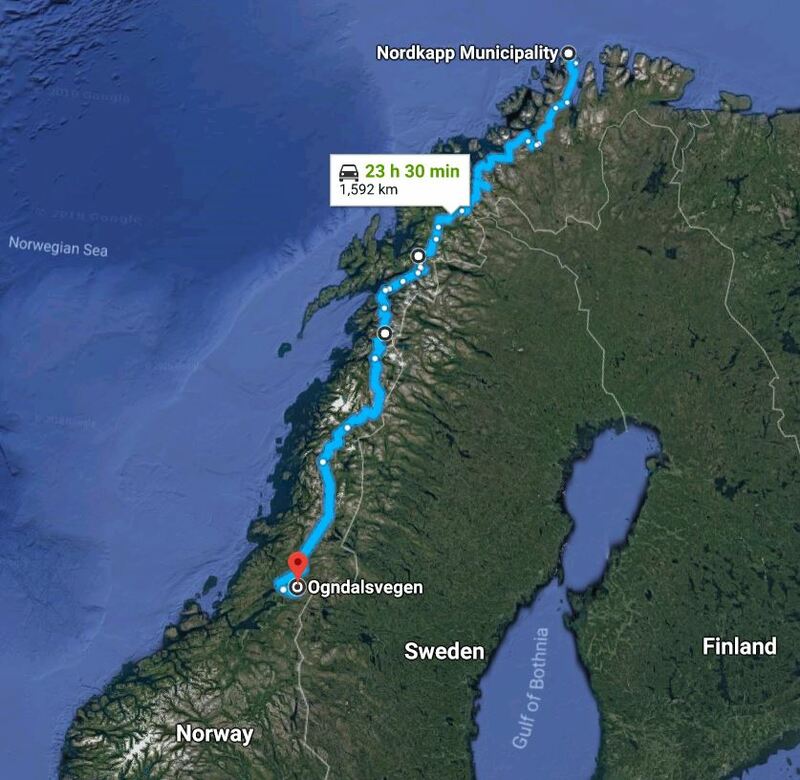 That meant a long, additional 3 days of driving well inside the Arctic Circle, the marker for which by this time, was just a few kilometers north of us. 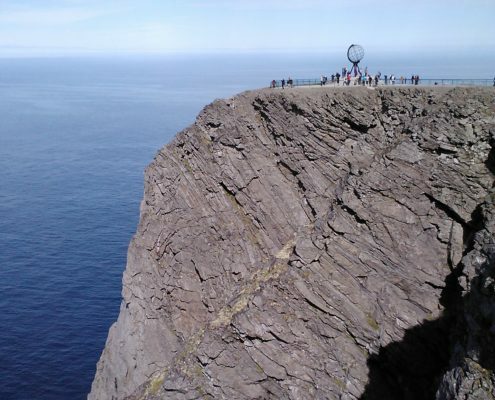 The final destination was now centered on Nordkapp (North Cape), the farthest point north reachable by car not just on the entire European continent, but on the international roadway system of the world! Very few people, we discovered, ventured that far to the north. For much of the driving time, very little modern-day facilities were encountered or even reachable. We were going to embark on a drive where we were pretty much on your own for the next 1,600 km. 1,600 km to the edge of a continent. 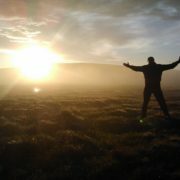 Crossing into the Arctic Circle and entering in the land of 24-hour sunlight was amazingly surreal. It was like entering into a different world. Any vestige of large trees or even tall vegetation of any kind was left behind and replaced with wide open Arctic tundra and large, grazing herds of reindeer. Anything man-made was far and few in-between. Countless waterfalls and patches of snow-covered mountains became ubiquitous. The numerous waterfalls in the far north of Norway, in particular, seem to flow with a special kind of beauty and ferocity. 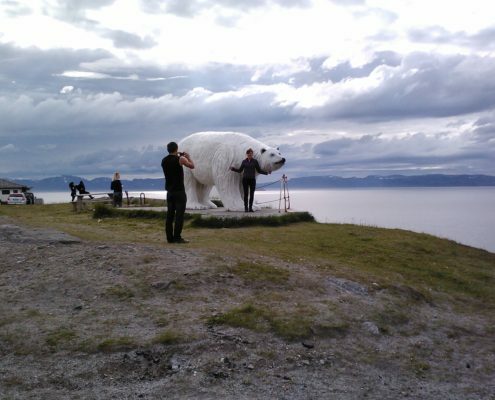 The last town we left behind was Hammerfest, the world’s northernmost city. 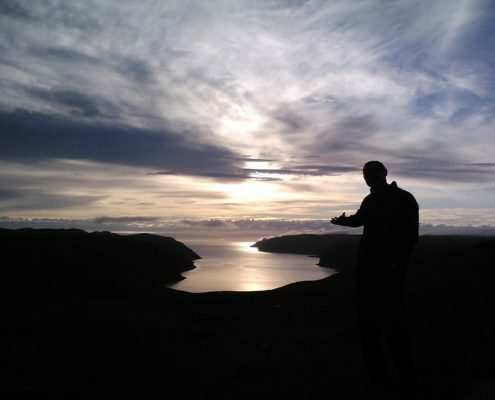 Overlooking Hammerfest, the world’s northernmost town. 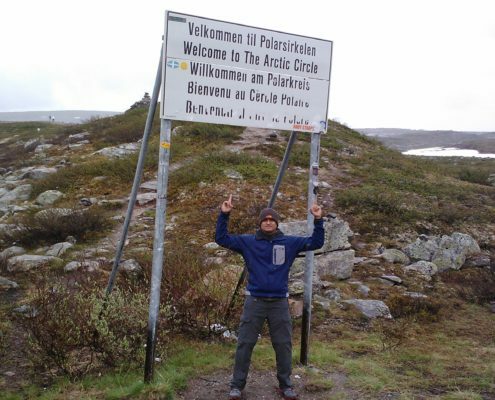 Entering into the Arctic Circle – Land of the midnight Sun. 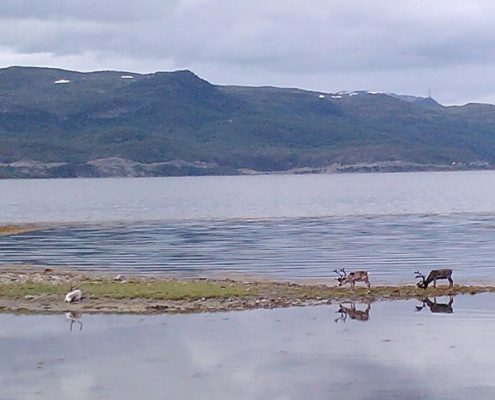 Santa’s little helpers at home in the Arctic Circle during the off season. 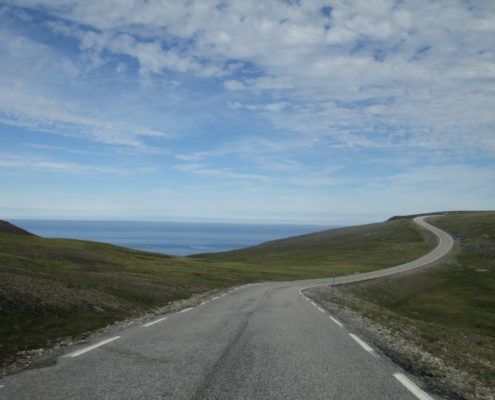 Once inside the Arctic Circle, the rest of the drive towards Nordkapp was like a screensaver at every turn. The magnificent beauty of nature in its original form, untouched by the hand of man, was overwhelming. Just wide open spaces as far as the eye could see. The Arctic Ocean hugs the desolate road for hundreds of kilometers. The weather became stranger as the drive towards the end of the continent progressed. 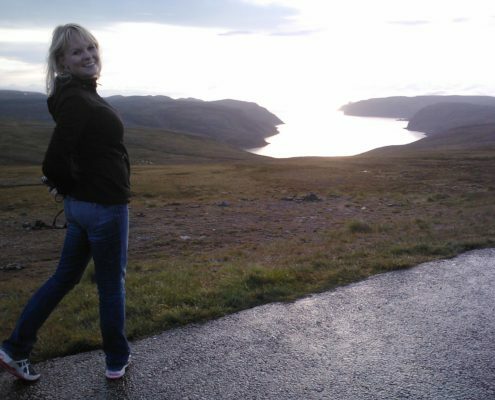 Felizia enjoying one of the many scenic views of the Arctic landscape. Konrad and Dominika enjoying the view. 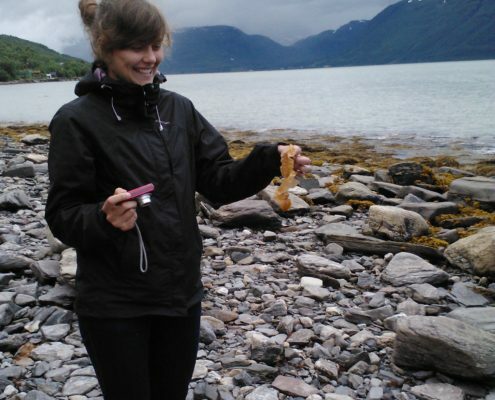 Dominika collecting seaweed as a souvenir. 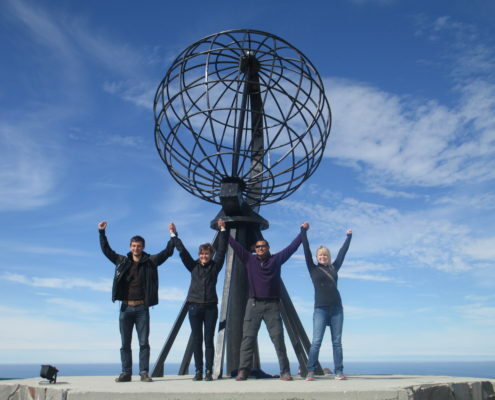 After countless stops along the way, we finally arrived at our destination – Nordkapp! If the theory that it is the journey, not the destination, that counts, then this would be that journey! The adventure to the top of the world was nothing short of spectacular. 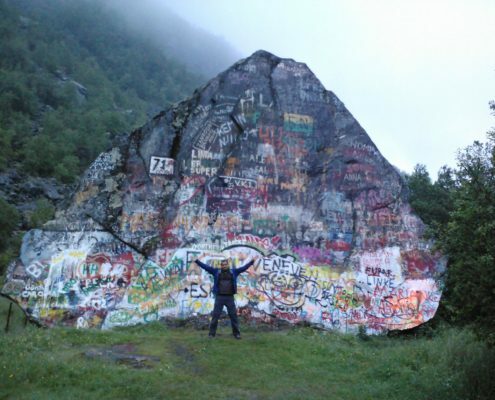 After numerous rivers, snow-capped mountains and reindeer herds, we finally made it to the literal end of the road, where it simply ended on a giant rock that dropped 300 m almost vertically down to the sea. Fantastic vistas in every direction was all the proof we needed that the long trip was more than worth it. Would I ever do it again? Yes! The land of 24 hours of continuous daylight in summertime. 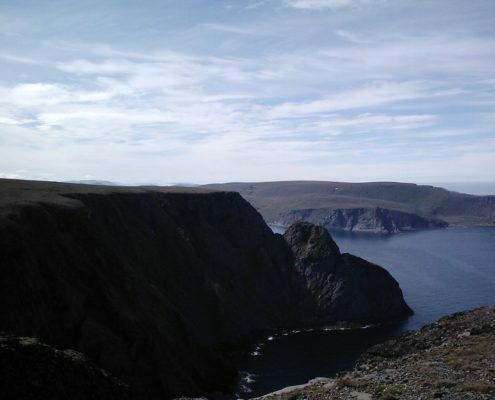 The literal edge of the European continent. A fitting end to the trip of a lifetime and new friendships found along the way. 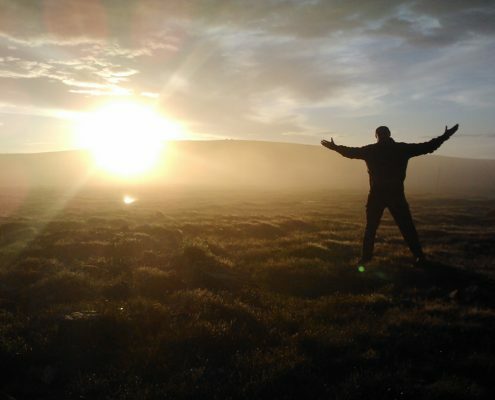 Journey into the Arctic Circle and Edge of a Continent - Land of the Midnight Sun! Milford Sound, New Zealand Arepa & Chicharrón! A Weekend Trip to Medellín, Colombia!